Ground shaking can be quite frightening. The Earth we walk on, and build on, becomes unstable. When it starts moving violently it can feel as if there is no safe haven for us. The Earth shakes with the passage of earthquake waves, which radiate energy that had been "stored" in stressed rocks, and were released when a fault broke and the rocks slipped to relieve the pent-up stress. The strength of ground shaking is measured in the velocity of ground motion, the acceleration of gound motion, the frequency content of the shaking and how long the shaking continues ( the "duration"). When assessing the potential shaking hazard at a given site, how frequently strong motion is expected to re-occur their is another critical factor to be considered. Interestingly, the characteristics of waves produced by an earthquake rupture are also strongly influenced by the fault rupture orientation, its depth, and the details of how the slip spread across the ruptured fault patch. For example, "directivity" causes earthquake ground motions in the direction of rupture propagation across a fault to be more severe than that in other directions from the earthquake source. 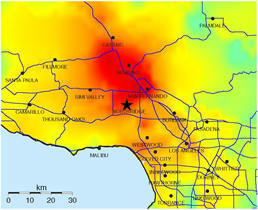 Directivity was clearly demonstrated in the 1994 Northridge M6.7 earthquake. The fault that broke in the earthquake was a reverse fault dipping to the south. The break began "down dip" and ruptured northward and upward, but never broke the surface. Luckily much of the energy released by the quake was directed north into less populated areas rather than south, toward the LA Basin. A rupture may also start at, or propagate into, strong patches along a fault plane. If the strong patch fails, it may slip more than the surrounding fault and radiate more strongly than adverage seismic energy. You are at little risk from even strong ground shaking if you are strolling in an open field (though it could knock you off your feet). Rather it is how earthquake ground motions affect structures, their contents, and the soils they are built on, that drive the risk. To understand our risk of losses from earthquakes we must understand the ground motion hazard at a given site as well as how vulnerable or fragile our structures and infrastructure are to these ground motions. The USGS has invested in developing tools to help planners, engineers, and the rest of us better understand the seismic hazards we will likely face someday so that structures can be designed with the appropriate level of seismic resilience to the shaking levels that occur at the site of its construction. Our current understanding of earthquake hazards has been integrated in the production of national and regional maps of probabilistic earthquake ground shaking through the USGS, National Seismic Hazard Mapping Project (NSHMP). These maps integrate the results of research in historical seismicity, paleoseismology, strong motion seismology, and site response. The maps try to take into account all the possible locations and magnitudes that are likely to happen in future hypothetical earthquakes. USGS scientists produced these maps since the early 1970s (with major improvements implemented in 1996) in close cooperation with engineers and building officials involved in producing building codes for earthquake-resistant building construction. As of the year 2000, all US model building codes incorporate ground motion hazard maps derived from the USGS studies. This integration of earthquake hazards science and building codes helps assure that structures will be engineered to have the appropriate level of resistance to catastrophic damage from shaking likely to occur in the area where they are built. Engineers also use these values to design important structures to specific levels of performance following an earthquake. These performance levels start at engineering for prevention of collapse and loss of life to designing structures that continue to function at a high level immediately following the earthquake. The NSHMP project updates the national map every six years integrating what has been learned from earthquake hazards research activities by universities, State Geologic Surveys, the USGS, and others to keep them current. Ground motion is affected by near surface soils, deep geologic structure such as sedimentary basins, and the mechanics of the earthquake itself. The NSHMP does a good job estimating the level and frequency of input shaking at a given site but does not account for many conditions that impact ground motion in a region. More sophisticated modeling of all these effects goes into the production of Urban Seismic Hazard Maps where they exist. This Seattle Urban Seismic Hazard Map shows shaking levels at 1 hertz frequency that have a 10% chance of being exceeded in the next 50 years. A high resolution version of these and other related maps are available from the USGS.